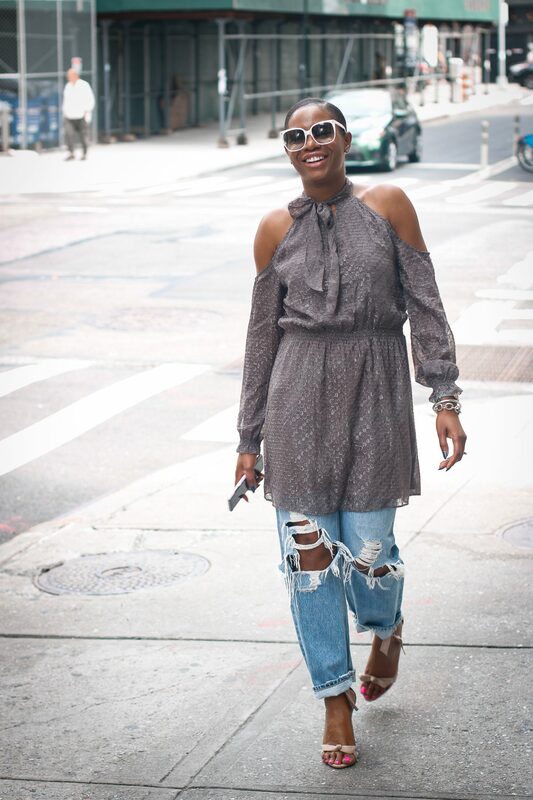 Dresses over jeans are absolutely fabulous and a fall-season must try! I have to admit I was a little reluctant to try this style. Needless to say I’m ecstatic that I gave it a try, because I love this stylish fall trend. The key to making this work is selecting the right dress to layer. If you want to layer a more fitted dress (never go too fitted, because it will hug the jeans, and look messy) make sure you pair it with fitted jeans. If the dress you select is more of a bias-cut you can pair it with boy-friend fitting jeans like I did in this post. Another key factor to consider when trying this look is that you need to style the trend with heels. In order to make this work you have to elongate your body, so the higher the heels the better. This outfit which was shot on the streets of New York city during fashion week, is stylish, chic and perfect for the changing climate. Now that the weather is still extremely warm outside it’s hard to determine what to wear, hence this trend allows you to wear some of your summer dresses by layering them. We all need transitional outfits, and the cold-shoulder dress over jeans is the perfect option so give it a try this season. When it starts to get cold, don’t hesitate to throw on a stylish coat to compliment this fashionable trend.